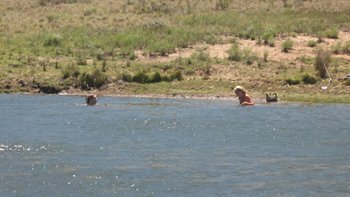 ALL OUTDOOR AND ADVENTURE SPORTS ACTIVITIES ARE PERFORMED AT YOUR OWN RISK. Surrounded by mountains, spectacular views and immense peace and quiet, Huntly Glen offers a getaway for those who love the outdoors and tranquillity. This is a “working farm” and we have made every effort to make Huntly Glen your home away from home. Join in with the daily activities and learn a bit about farming. Depending on the time of year, be shown how to “throw a fleece” or shear a sheep or angora goat. At lambing or goat kidding time there is also the possibility of helping to bottle-feed orphan lambs or kids. All farm roads are passable for vehicles with high clearance, so go out for a game drive on your own. There are some wonderful picnic areas, so disappear for the day. There are safe hikes and shorter walks, with roads and farm tracks criss-crossing the farm, bringing you in contact with the abundant bird-life. Because this area is a meeting place of 4 different vegetation biomes, there are birds from all 4 biomes to be seen, making this a birders paradise with over 200 bird species having been recorded, as well as 2 breeding pairs of Black Eagles, and in the summer months there are breeding pairs of Blue Cranes in the higher altitude grassland area, as well as Cape Vultures that circle there daily. 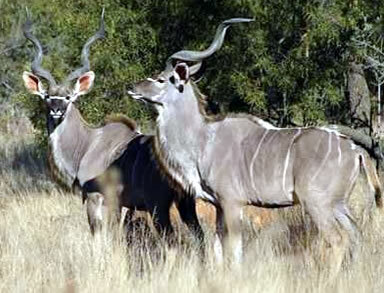 While out in the bush you will have ample opportunity to view game such as the Greater East Cape Kudu, Red Hartebeest, Black Wildebeest, Zebra, Duikers, Steenbuck, Blesbuck, Springbuck (both common and black), Mountain Reedbuck, Vaal Rhebuck, Warthog, Baboons and Vervet monkeys in their natural habitat. 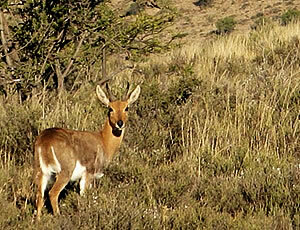 Look out for Grysbuck and Bushbuck in the more densly wooded areas, as well as Fallow Deer. There are plenty of smaller animals to be seen as well, such as Dassies (Rock Hyrax), Elephant Shrews, Meerkats and various species of Mongoose. 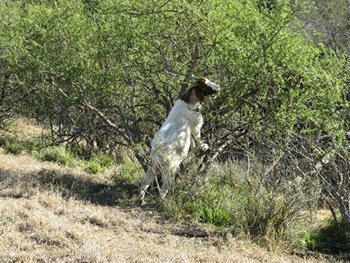 If you are lucky, you may catch of glimpse of the nocturnal animals like Caracal, Black-backed Jackal, Silver Jackal, Bat-eared Foxes, Maanhaarjakals, Spotted Genets, Serval cat, Aardvark, Bushpigs and Porcupines. In addition to all this, there is also a large cave situated in a particularly remote and beautiful area of the farm, fossil site and plenty of historical sites relevant to the Scottish Settlers to be visited. A night drive and sundowners in the mountains can be organised, and when not game viewing, take a picnic lunch and relax beneath the river willows next to the bass dam. Try your hand at bass fishing under the watchful eye of the fish eagle. 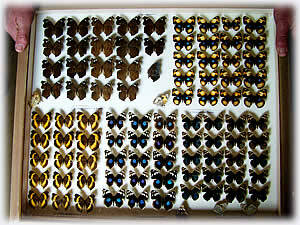 There is a tennis court available for the energetic, as well as the largest privately owned and collected butterfly collection in South Africa to be viewed. This collection is also internationally recognised. 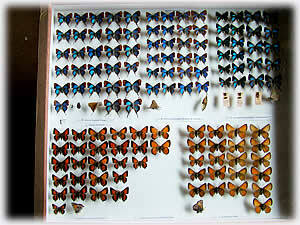 Spend an hour or two with Ernest, and you are guaranteed to look at insects through new eyes. Our night skies are an absolute must for all the “starry” folk - the “non-starry” folk will be spell-bound as well. For those who want to de-stress, there are hours and hours to indulge in photography, painting and other relaxing pursuits. The beautiful landscapes, stark contrasts and open spaces that are to be found in this haven of tranquillity are bound to put you in a creative mood, so bring your camera, paints and books, and because there is no specific schedule or itinerary to follow, you can un-wind at your own pace. When not going on a game drive, enjoying a walk or game of tennis, or just relaxing next to the pool – then indulge in a little self-pampering with a choice of treatments like a Hot Stone Massage, Indian Head Massage or the ultimate in relaxation, an Aromatherapy Massage. Manicures and Deluxe Pedicures for those tired feet are on offer, as well as rejuvenating, hydrating, super-relaxing Facial Treatments using only South African products. 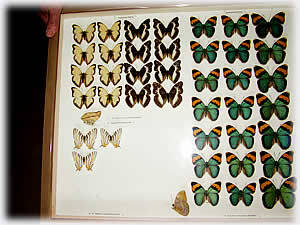 Huntly Glen's pièce de résistance, however, are two unique collections. 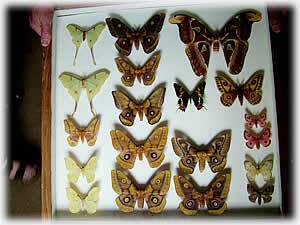 Ernest has put together the largest indigenous butterfly and moth collection in South Africa - some 150 trays. 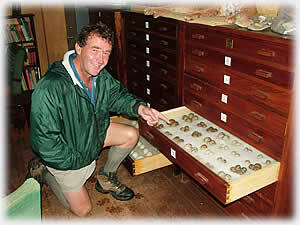 He also has the largest collection of birds eggs in the country as well as collections of beetles, artefacts and skulls. 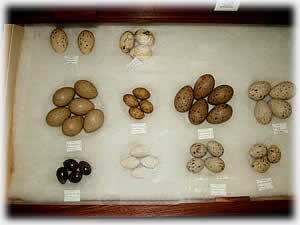 These collections may be viewed by appointment. PLEASE NOTE: that prospective day visitors should phone ahead to make an appointment. The reason for this is simply that we are more than half an hour's drive from the tar road and we would not wish you to make the journey only to be disappointed.